President George W. Bush’s national security advisor, Condi Rice, warned Americans that Saddam Hussein’s (nonexistent) weapons of mass destruction could result in a mushroom cloud going up over an American city. No such threat existed. But today a very real threat exists over all American cities, and the national security advisor does not notice. Similar propaganda is being spread in the UK where defense minister Michael Fallon declared Russia to be a “real and present danger” to Europe. US troops and tanks are being rushed to the Baltics on the pretext that Russia is going to attack. That such blatant lies can issue from high government officials without a shred of evidence and without shame should scare you to death. We are witnessing the total disrespect for truth and human life by high government officials and the presstitute media. The propaganda is driving the world toward war. The propaganda has destroyed the trust between nuclear powers and has resurrected the threat of nuclear armageddon. The Russian government sees that Washington and its NATO vassals are conjuring a nonexistent Russian Threat. Clearly this conjured threat has a purpose that intends Russia harm. 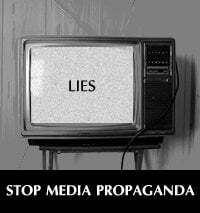 Washington’s propaganda spread by the presstitutes is the most irresponsible act in human history. Reagan and Gorbachev succeeded in removing the threat of nuclear war, and the crazed neoconservatives and their media whores have brought it back. Washington’s propaganda attack on Russia and Vladimir Putin is like Washington’s attack on Afghanistan and Osama bin Laden, Iraq and Saddam Hussein, Libya and Gaddafi. Does this mean that Washington intends to attack Russia in a pre-emptive nuclear strike? If so, it means the end of the world. Clearly, the threat to the United States and the entire world resides in Washington and not in Moscow. The threat is the crazed neoconservative ideology of US world hegemony supported by the unbridled greed of American corporations to control the resources of the world. Putin understands the seriousness of the situation and is working hard to diffuse it, but Washington has made it impossible to diffuse. Washington’s price is that Putin must hand over Crimea and the Russian Black Sea naval base to Washington, abandon the Russian populations in southern and eastern Ukraine, and accept NATO military bases in Ukraine. Washington’s demand is a demand for Russia’s pre-emptive surrender. In the CNN propaganda show, Wolf Blitzer failed to report that German intelligence challenges all of Washington’s claims about Russia and that the French and German governments have finally realized that Washington is insane and are working desperately to stop Washington’s drive toward war. Washington and its UK puppet have spent the entirety of the 21st century creating death and destruction. Seven countries have been invaded, bombed, or droned in order “to spread democracy.” Iraq is destroyed, as is Afghanistan, Libya and Somalia . Syria nearly so, and Pakistan and Yemen are politically and socially destabilized by incessant US air attacks. The democratic, elected, governments of Honduras and Ukraine have been overthrown by US coups. Venezuela is next in line, with Bolivia, Ecuador, Argentina and Brazil waiting their turn. Washington has given the world 14 years of brutal and inhumane war. Isn’t this enough evil? Does Washington have to give us more? Washington and the presstitutes have lost their humanity. They have become agents of evil. If mushroom clouds appear, the responsibility will lie with Wolf Blitzer, CNN, and the presstitutes who spread the message of war.